We seem to have a knack for lousy timing. Christi developed vertigo while I was still in Beijing on the way home from our trip to get Cali. Thinking it might be a stroke, she rode in an ambulance to the emergency room. Graci got the flu, had a precipitous drop in blood pressure and had to be life flighted while I was in Colorado for a sales meeting. Two weeks ago, Jesi broke her foot while Taylor, Parker and I were in the Lone Peak Wilderness with a minimum two-hour backpack trek out. Tonight is the last night of Christi's trip to New York. She is on a plane home as I type. The kids and I had just had a family council and planned the rest of the evening. It would consist of trying to put the house back together before mom got home, me making a yummy dinner (egg mcmuffins!) and some relaxation with a Cosby show to end the evening. We closed with a prayer, went to our respective assignments and promptly heard a scream of pain from Xander. It seems a chair jumped out and mugged him. So here we are in the emergency room. We haven't seen the doctor yet, but I'm guessing 3-5 stitches will be in order. 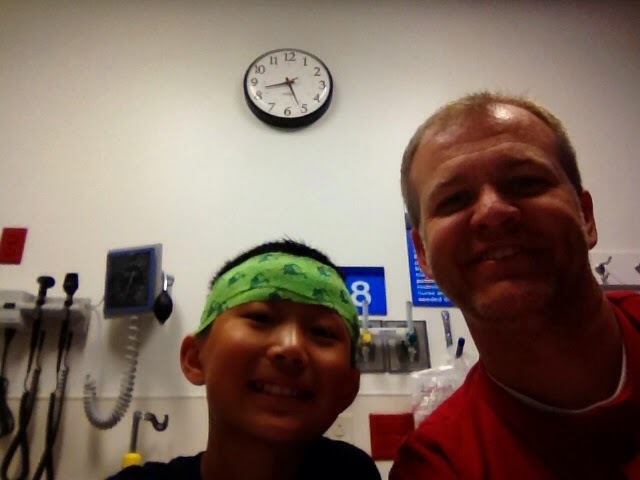 What is it with us and emergency room trips when only one parent is present? So sorry!!! It makes for good stories though!!! It seems that always happens to us too--although our stories aren't so extreme!!! Good luck Xander! Oops if this is a double sorry! Many Children = Many visits to the ER. We have only half the family you do and we are a frequent customer of the ER. Wish you could get air miles for that. Anyway, good to see Xander featured in a post even if it is an ER visit. Oh, those mugging chairs! I love that you are watching The Cosby Show...such fun memories! Never a dull moment, eh? You are earning bigger and bigger angel wings every day.